I'll be offering a new course during Fall, 2019, The Joy of Information. The Joy of Information introduces students to a positive Information Science by focusing upon information in contexts that are perceived as joyful, sublime, upbeat, creative, interesting, pleasurable, and fun. In doing so, it intentionally brackets and places aside information experiences associated with negative or quotidian states such as work, problems, pain, conflict, boredom, everyday routines, and unconsciousness. ​Participants will explore the idea that positive information phenomena have distinct qualities and are important to what Plato called eudaimonia—a flourishing life. Practically speaking, enrollees will discover how information institutions and their stakeholders may mediate and champion a positive approach to their information resources, systems, and services. The first offering of this course during Fall 2019 will be centered upon leisure, an information-rich, heterogeneous, and joyful domain. To that end, a theoretical framework of leisure, the Serious Leisure Perspective (SLP) (Stebbins, 2001) will be used to systematically analyze leisure and its information phenomena. Over the course of the semester, casual leisure, serious leisure (including hobbies), project-based leisure, and devotee work (paid work that feels like leisure), will be examined for their informational patterns and distinctions. Though the SLP will organize our approach to leisure, students will be encouraged to challenge and critique its authoritative stance, especially concerning its cultural range and the treatment of leisure that is centered upon multimedia and online experience. A variety of unconventional assignments will fortify understanding of the topic. For starters, students will use the SLP to map their own leisure pursuits; subsequently, they will conduct an original visual research project to document positive information phenomena within their own leisure-related information collections. Then, embracing a broader vista, the class will work together to analyze informational patterns within popular culture and media via a content analysis of the hit sitcom about metal detecting, Detectorists. Culminating several weeks of concatenated secondary and original research, deep thinking, and discussion, the semester will end on an exuberant yet practical note. Participants will design, package, and promote a joyful/positive information experience that can be offered to leisure-seeking patrons of an information institution, broadly construed. In June I'll be attending the 10th international Conceptions of Library and Information Science (COLIS) Conference. It is hosted by the Department of Library and Information Science and Book Studies at the Faculty of Arts, University of Ljubljana, Slovenia. There, I'll present the paper Turn, Turn, Turn and contribute to the conversation cafe, About time: Re-thinking information through the lens of time and temporality (organized by Dr. Jutta Haider). The abstract for Turn, Turn, Turn is below. This intellectual history article outlines and illustrates a series of theoretical “turns” that have occurred within information science between 1986 and the present. A selective literature review of theoretical articles appearing in the core journals and conferences of information science will serve as the research method, followed by conceptual analysis. The overall goal of the paper is to help students and scholars become more aware of the trends that sweep across a discipline so that in the future new approaches can be employed in an enlightened manner and with a modicum of levity. To start, the idea of the turn is introduced and a strategy for qualifying turns within information science is articulated. Then, each turn is addressed chronologically with attention to its: origins, tenets, champion(s), seminal studies and publications, concomitant methods, and enduring contributions. The following turns will be included, though the extent of treatment will vary: user-centered (cognitive) turn, affective turn, domain analytic (social/socio-cognitive) turn, metatheoretical turn, everyday life turn, critical/linguistic turn, practice turn, and the embodied turn. In the discussion, affinities, aversions, and polarizations between and among different turns will be acknowledged. The article closes with the author’s reflections on the positive and negative impacts of turns for knowledge production; recognition of nonpartisan individuals within our community who have resisted turns; and tongue-in-cheek suggestions for future turns that may enrich the information science enterprise. During Winter semester of 2019 I am happy to be teaching a new Information Workshop entitled Information and Contemplation. It is inspired by a course of same name taught by Dr. David Levy at the University of Washington's iSchool. The syllabus reads, "This new INF1005/1006 Workshop introduces students at the Faculty of Information to contemplative practice and explores its potential for sparking positive change in Information Studies and in information institutions. The goals of the course are as follows: To examine theoretical points of contact between Contemplative Studies and Information Studies; to imagine contemplative programs, services, and resources for the betterment of information institutions and their publics; and to give participants a structured opportunity to develop their own contemplative practice." A visual version of the syllabus, inspired by a treasure map, is available here. In the Fall 2018 offering of The Information Experience (a required course in the Library and Information Science concentration), students had a hands-on experience with Marcia Bates' idea of the "red thread of information" that is woven through "the social texture of people's lives." Thanks to Masters of Information students Linda Yang, Karen Fingas, Alexandre (Sasha) Ioffine, Mark Curran, and Joshua Shum for leading this great activity. This Halloween a very special guest appeared in my course, INF1323: The Information Experience. It was the one and only Dr. Marcia Bates! In actuality, the visitor was Master of Information student, Stephanie Wilcox, dressed in a costume inspired by the work of Dr. Bates--shown at left. To that end, she is draped in "the red thread of information" (from the award-winning article, Invisible Substrate of Information Science). What is more, Stephanie went from person to person giving away berry candies (in the spirit of the classic information behaviour model, Berrypicking). A big thanks to Stephanie for making everyone smile (including Dr. Bates, when she saw the photo) and for a most creative application of information science ideas. Thanks also to James Zhan for the photograph. Thank you, ASIS&T, for granting me the 2017/18 ASIS&T Lecture Series Award. Through this award I will travel to the School of Information Management (SIM) at Sun Yat-sen University (SYSU) in Guangdong, China, from June 3-14, 2018. My goal is to initiate a more culturally and geographically expansive vision of information science that integrates North American and Chinese perspectives. The visit will have three elements that culminate in the keynote ASIS&T Lecture. First, I will oversee an arts-informed research project at SIM to capture visual conceptions of “information.” Second, I will lead a workshop with SIM students and faculty to analyze the images, thereby creating a bilateral exchange about the nature of information. Third, I will deliver the ASIS&T Lecture, entitled The Red Thread of Information. Altogether, these happenings will celebrate information and information science from Chinese and North American standpoints; introduce new, creative research methods to the SIM community; and showcase ASIS&T’s contribution to scholarly cooperation worldwide. The abstracts for my two presentations are below. I wish to recognize my host and collaborator for this project, Dean Miguel Nuñez and to thank SIM and SYSU for supporting the visit. This lecture is geared for scholars, educators, students, and practitioners across the social sciences and affiliated professions who wish to learn more about innovative arts-informed visual methods, the draw-and-write technique, and its applications for research and education. During the session, I will present an overview of the iSquare Research Program that utilizes the draw-and-write technique. To help others replicate the approach, I will then discuss the types of questions that can be asked and answered with drawing methods; review analytical options for visual data; demonstrate creative presentation formats; and share my experiences with the draw-and-write technique in classrooms to teach fundamental principles. In a conversational environment, all participants will be able to voice questions and concerns about the method and the get-together will seed a community of interest for the future. This presentation will engage a selection of important ideas in information science through the work of Dr. Marcia J. Bates—a winner of ASIS&T’s Award of Merit (2006) and two-time recipient of JASIS&T’s Best Paper Award. The audience will come to understand Bates’ notion of the field’s special “metaperspective” that directs attention at the structure and pattern of information. Allied disciplines with similar purposes will be recognized, leaving the audience with a better sense of the place of information science in the university and society. Bates’ provocative metaphor that casts information professionals as actors will be considered, along with the question: Do information professionals require knowledge of the topics and literatures they mediate? Special attention will be given to the central role of ASIS&T and its journal, JASIS&T, to our understanding of information and the development of information science worldwide. Attendees will gain the ability to discern “the red thread of information in the social texture of people’s lives,” (Bates, 1999) which is a central mandate of libraries and other information institutions. The session is designed to inspire, and will be an opportunity to compare Chinese and North American experiences of information science. To mark the occasion, everyone will be given a handmade souvenir that helps them to carry these new ideas into the future. In late March 2018 I'll participate in the iConference at the University of Sheffield, UK. There, I will present on the panel Contemplating Information in the Pleasurable and the Profound with Dr. Kiersten Latham, Mr. Tim Gorichanaz, and Ms. Anh Thu Nguyen. I am also a contributor to the workshop iWords: Exploring the Interdisciplinary Vocabularies of Information Research, organized by doctoral students at the iStories Research Lab of the University of Washington [Andrea Hoff, Michelle Kaczmarek, Robyn Schafer, Siguna Shankar, and Bonnie Tulloch]. alise webinar: "10 Ideas for Innovative Teaching"
On Friday, September 29, 2017 (at 2:00 Eastern Time), I presented a webinar for ALISE (Association for Library and Information Science Education). In the webinar I discussed "10 Ideas for Innovative Teaching." Mindfulness meditation, souvenirs, iSquares, and "creative deliverables" were just a few of the pedagogical surprises offered. Each idea was presented with an eye to turnkey implementation, so that other educators can adopt and implement one or more of the strategies right away. Real student feedback drawn from course evaluations supplied a student perspective, when available. Time was reserved at the end of the webinar to entertain additional ideas for innovative teaching, sourced from the audience. The resources mentioned at the webinar are available here. On August 29, 2017, Eva Jansen Hourihan passed her Final Oral Exam--officially becoming Dr. Jansen Hourihan. Her thesis, Let’s Talk About the NOC: an Ethnography of Classification is a ground-breaking ethnographic study of a classification system. Pictured above are Jenna Hartel (Supervisor), Dr. Jansen-Hourihan, Lynne Howarth and Chun Wei-Choo (Committee Members). Professor Richard Smiraglia of the University of Wisconsin, Madison (not pictured) served as the External Examiner. Jenna Hartel, Jess Whyte, and Matt Ratto, celebrating after the defense. On August 22, 2017, Jess Whyte successfully defended her master's thesis, Molding Makers: An Ethnography of an Academic Makerspace. Her excellent work was accepted without any revisions. Participants in the defense were: Dr. Jenna Hartel (supervisor), Dr. Matt Ratto (committee member), Dr. Heather Moorefield-Lang of the University of South Carolina School of Library and Information Science (external appraiser), and Dr. Chun Wei Choo (chair). In August, 2017 I participated in a conference at the University of Copenhagen, Social Epistemology as Theoretical Foundation for Information Science: Supporting a Cultural Turn. This event featured a keynote address by Dr. Steve Fuller and presentations by other experts on social epistemology, classification theory, and/or domain analysis. My role was to present a summary of the ideas covered on the first day of the conference. In September, 2017 I participated in two sessions of the Diversity by Design Symposium at the University of Toronto. A workshop, "The Information Horizon Interview," was hosted by students from the Winter 2017 offering of INF2332: Information Behaviour, namely: Daisy Dowdall, Glyneva Bradley Rideout, Ken Konkatong, Elisabeth Saunders, Maria Ruiz, Marie Tossios, and Martin Chandler (see photo, below). Our 90-minute session included four interactive elements: 1.) An introduction to information behaviour research and the information horizon interview;2.) “Mad Lib” case studies of students’ information horizon projects; 3.) A step-by-step tutorial on the information horizon interview that addresses ethical protocols, research questions, sampling, interview guide design, conducting the interview, data analysis, and research dissemination; and 4.) Small group practice sessions. Our team at the Diversity by Design Symposium in Toronto, Canada. From left to right: Elisabeth Saunders, Marie Tossios, Glyneva Bradeley Rideout, Maria Ruiz, Ken Kondatong, Jenna Hartel, Daisy Dowdall and Martin Chandler. Also, along with my colleagues, Kathleen Scheaffer and Anh Thu Nguyen, I participated in "The diversity of mindfulness: Inclusion and information through wellness-infused pedagogy, resources, spaces, research, and student participation at the Faculty of Information, University of Toronto." During July, 2017 I presented a two-part workshop (with the support of my collaborator, Dr. Pauline Joseph), entitled Framing Information as Art, at the Archival Education and Research Initiative (AERI), in Toronto, Canada. A proposal (PDF) that describes the sessions is available here and the program for AERI will be announced soon. Rebecca Noone, Stephanie Posa, and Annie Xu, members of the iSquare Research Team, made fantastic contributions to this session. From left to right: Rachel Lee, Erica Friesen, Yuxi Ren, Dr. Bates, Daina Cers, Jenna Hartel, and Anh Thu Nguyen. In June, 2017 I participated in a panel, entitled, Marcia J. Bates: Past--> Present-->Future at the Canadian Association for Information Science (CAIS) annual meeting in Toronto, Canada. The panel session explored, critiqued, and celebrated the work of canonical information scientist, Marcia J. Bates. To begin, I surveyed her oeuvre. Then, five graduate students from the Faculty of Information (pictured above: Rachel Lee, Erica Friesen, Yuxi Ren, Dr. Bates, Daina Cers, Jenna Hartel, and Anh Thu Nguyen) reported on their semester-long explorations of a singular concept by Bates. Each student’s talk featured a summary and critical examination of a seminal idea by Bates in its original historical context. Then, the same concept was considered in the light of this Information Age. Following each talk, Marcia J. Bates shared her reflections. Ample time was provided for discussion among Dr. Bates, the panelists, and attendees. A description (PDF) of the session is available here. During summer semester, 2017, I taught INF2330: Information Ethnography. The course followed an intensive, 6-week format (Monday & Wednesday, 4:00-6:00; May 1 - June 12). See the Faculty of Information timetable for details. On February 17, 2017, Elysia Guzik passed her Final Oral Exam--officially became Dr. Guzik. Her thesis, Informing Identities: Religious Conversion Experiences of Muslims in the Toronto Area, explores the information practices that occur during the process of conversion to Islam. Participants in the Exam included: Elysia, Jenna Hartel (Supervisor), Nadia Caidi (Committee Member), Simon Coleman (Committee Member), Chun Wei Choo (Examiner) and Melissa Gross (External Examiner). ​With Andrew Cox (Sheffield, UK) and Brian Griffin (Toronto), I am co-editing a special issue of Library Trends on "Information and the Body." The deadline to submit a title and extended abstract is January 15, 2017. The detailed call for proposals is available here. 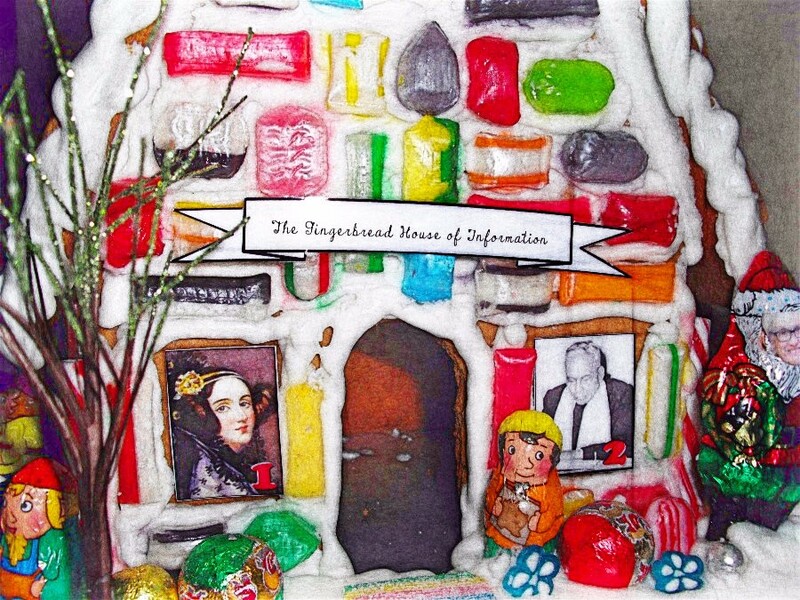 Who lives in The Gingerbread House of Information? The Gingerbread House of Information is inhabited by information scholars (broadly construed) and other great iSchool citizens. Drop by the Inforum soon for a look at this half-baked confection. If you can't come to the Inforum you can visit The Gingerbread House of Information online. ​I was a keynote speaker at the KNOWeSCAPE conference in Sofia, Bulgaria, February 22-24, 2017. The KNOWeSCAPE initiative is funded by COST (European Cooperation in Science and Technology) and entails four working groups whose main objective is to "advance the analysis of large knowledge spaces and systems that organize and order them." Thank you, Library Journal and ALISE, for granting me the 2016 Excellence in Teaching Award. I promise to return this honor by many more years of dedication to the academic discipline of library and information science and the profession of librarianship. This is also an important moment to recognize all my amazing teachers: Marcia Bates, Mary Niles Maack, Christine Borgman, Jonathan Furner, Greg Leazer, Leah Lievrouw, Sanna Talja, Reijo Savolainen, Birger Hjorland, Steve Fuller, David Jenkins, and many others. Thanks also to my colleagues who assembled the nomination, especially Aleatha Cox and Dean Wendy Duff. Finally, this award is a result of the boundless creativity, intelligence, and goodwill of students at the Faculty of Information, University of Toronto, who are truly a joy to teach. In mid-January I attended the ALISE Conference in Atlanta, Georgia. There, I presented the paper "Multimedia Approaches to Learning the Foundations of Library and Information Science" with co-authors Elysia Guzik and Brian Griffin. At ALISE I also accepted the 2016 Library Journal/ALISE Excellence in Teaching Award. During Winter semester, 2017 will teach INF2332: Information Behaviour. I look forward to introducing students to the seminal works of this literature and to conducting original information behaviour research together. In mid-October, 2016 I attended the ASIS&T Annual Meeting in Copenhagen, Denmark. There, I co-host a workshop on Visual Research Methods with Dr. Krystyna Matusiak of the University of Denver and Ms. Leslie Thomson of the University of North Carolina at Chapel Hill. An overview of the workshop appears below. Visual research methods have been traditionally employed in social sciences, particularly in anthropology and sociology. Increasingly, image-based research inquiry is getting attention in library and information science research and education. Researchers engage in gathering data in the visual mode of representation by encouraging participants to draw or by eliciting photos and other visual artifacts. Visual documentary evidence or visual records created by users in their professional or personal information practices are another rich source of data. While visual data collection is relatively easy, data analysis of image-based records is inherently complicated. This half-day workshop, sponsored by SIG-VIS, will provide a succinct introduction to visual research methods and then focus attention on visual data analysis. In August, 2016, I attended Diagrams, an international interdisciplinary conference series, covering all aspects of research on the theory and application of diagrams. At Diagrams, I presented a tutorial, "Visualizing Information" with iSchool student Rebecca Noone. An abstract for the tutorial is below. This tutorial introduces the Diagrams community to arts-informed visual research, using the draw-and-write technique as an example. It does so in the context of the iSquare Research Program (www.iSquares.info), an ongoing effort to understand and document “information” as a visual phenomenon. The 90-minute session will begin with a demonstration and description of the draw-and-write technique as it is employed in the iSquare project. Then, a sample of drawings of information will be displayed and analytical attention will be placed upon link diagrams, grouping diagrams, and pictorial metaphors for information. The audience will be engaged in a game that will help them understand the distinctions between these major forms of graphic representations. Next, the iSquare team’s artist-in-residence will locate the iSquares in a genealogy of contemporary art’s themes and practices and demonstrate how the images can be used in art exhibitions and interactive story-telling. To conclude, the pedagogical applications of the draw-and-write technique and the iSquare protocol will be discussed from the point-of-view of an instructor and graduate student. The event includes several hands-on activities, interdisciplinary perspectives from three fields (information science, visual studies, and education) and a collaborative spirit. 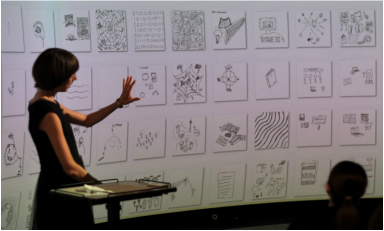 Participants will be encouraged to apply arts-informed visual methods and the draw-and-write technique to their own research questions, and they will leave the tutorial with a fresh sense of information as a visual phenomenon that can be better understood through diagrams. An interactive art exhibition of a portion of the iSquare corpus can also accompany the tutorial and remain on display for the duration of the Diagrams conference. During summer 2016 I offered a reading course on the ﻿Serious Leisure Perspective﻿ (SLP). As a reading course the primary activity was independent student reading and reflection. The course was supplemented with a peer discussion group; online searching and literature reviews on an SLP-related topic of personal interest; and a written final paper or creative deliverable in another format. The schedule for the semester loosely followed the intellectual history of the SLP. Assigned readings favored original publications by Stebbins; later synthesis and alternative perspectives were provided for contrast. More information about the reading course is available here. The paper, "Information Behaviour, Visual Research, and the Information Horizon Interview: Three Ways." The panel, "Domain Analysis: Assumptions and New Techniques for Articulating Domains," hosted by Eva Jansen and with Birger Hjorland and Isto Huvila. The panel, "What Every Body Knows: The Body in Information Behaviour and Information Practices," with Andrew Cox, Brian Griffin, AnneMaree Lloyd and Michael Olsson. This past fall, my students in INF1300: Foundations of Library and Information Science used the iSquare Protocol to conduct research on information, the Internet, and librarianship. The project is profiled at a new website (Information/Internet/Librarian) and a glimpse of arts-informed deliverables appear at left. Congratulations to all participants for producing incredible papers and artworks that offer new insights into fundamental concepts of library and information science. 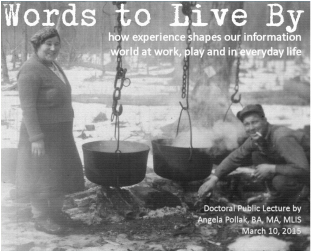 On Tuesday, April 26 (3:00-4:00), 2016 I delivered an invited lecture at the Department of Library and Information Studies at the University of Buffalo. My presentation was entitled "Pictorial Metaphors for Information" and was based on iSquare research I conducted with Dr. Reijo Savolainen; an abstract is below. The iSquare Research Program is an arts-informed, visual study in which people answer the question “What is information?” in the form of a compact line drawing, coined an “iSquare." Since 2011, more than 2,000 iSquares have been collected from diverse academic disciplines and from around the world. In this presentation, Dr. Jenna Hartel will provide an overview of the iSquare project and report recent insights into the pictorial metaphors associated with information. Eight common pictorial metaphors for information that appear in the iSquare corpus—earth, web, tree, light bulb, box, cloud, fishing/mining, and eye—will be displayed and explicated imaginatively. The talk will also address the potentials of arts-informed, visual research for social scientific inquiry and will note implications of graphical elicitation techniques for research, education, and practice in information studies and beyond. In March, 2016 I attended the iConference in Philadelphia, Pennsylvania, USA. I ran the workshop "Analyzing Visual Data" with iSchool doctoral student Rebecca Noone and contributed to the workshop "Mapping the Positive Turn" with my collaborators Andrew Cox, Brian Griffin, and Robert A. Stebbins. Both abstracts are below. This half-day workshop will bring together scholars, practitioners, and students from across the iSchool community to discuss current research around “positive” information phenomena, that is, nonproblematical perspectives on the information experience. The session will explore a range of positive concepts recently emerged in information science, such as: well-being, happiness, leisure and positive computing. Throughout the session, our conversation will move between information science to specialties such as positive psychology, positive sociology, and the sociology of happiness; we will clarify terms, concepts and themes and ultimately generate an interdisciplinary map of positive scholarship. Participants will share their own thinking and research on these topics, map current and future research trajectories, and produce a foundation for future collaboration. In keeping with a spirit of interdisciplinarity, the event will feature a keynote by the architect of positive sociology, sociologist and leisure scholar Dr. Robert A. Stebbins. A group of very creative and spirited students in my INF1300: Foundations of Library and Information Science class, celebrated Halloween in costume -- as A Box of Crayons. This is the cutest costume I have ever seen! A big thanks to the whole Box for enlivening class and the iSchool that day. In early November 2015 I attended the ASIS&T Annual Meeting in St. Louis, Missouri, USA. For this conference I organized a panel session about the ﻿international iSquare research project﻿; the panel was entitled "Visualizing Information Worldwide" and details appear below. An exciting feature of this event was the participation of iSquare team members Rebecca Noone, Stephanie Power, Pavel Danzanov and Bridgette Kelly, all from the Faculty of Information, University of Toronto. Twelve scholars based at information programs worldwide have recently participated in research that asks: How is the concept of information visualized in my community and beyond? The study employed an arts-informed, visual methodology and the draw-and-write technique to stimulate local and global conversations about the pictorial nature of information in society. The work has generated new insights into information as a visual phenomenon and generated an archive of “iSquare” images to be used for information research, education, and practice. As a contribution to the conference theme of “Impact on Society,” this panel introduces the project, describes its technical infrastructure, highlights emerging social scientific and artistic outcomes, and reports cross-cultural discoveries. The multimedia and interactive session will include in-person presentations, short videos from collaborators overseas, an expert discussant, dialogue with the audience, and an art exhibition. September 16-18, 2015 I participated in the 4th International Visual Methods Conference at the University of Brighton, England. My paper, "Visual Analysis Through Four Lenses" critiqued four analytical devices used in the iSquare study: compositional interpretation, thematic analysis, content analysis, and pictorial metaphor analysis. University of Western Ontario (UWO) doctoral candidate Angela Pollak successfully defended her dissertation on March 10, 2015 and she is now officially Dr. Pollak. Her thesis (abstract) is a ground-breaking study of information experience in the village of Whitby, Ontario; it looks simultaneously across everyday life, work, and leisure contexts. The study was supervised by Dr. Lynne McKechnie and the examination committee consisted of Dr. Carole Farber, Dr. Paulette Rothbauer, and Dr. Kim Clark (all of UWO), with myself as external examiner. Bravo, Angela! June 23-25, 2015 I participated in the i3 Conference (Information: Interactions and Impact) at Robert Gordon University in Aberdeen, Scotland. There, I presented a paper co-authored with Reijo Savolainen (University of Tampere, Finland), entitled "Pictorial Metaphors for Information." Our paper discussed eight common pictorial metaphors that appear in iSquare drawings of information; the manuscript is published in the Journal of Documentation. As a Visiting Fellow at Curtin University in Perth, Australia, I gave a public lecture to mark Australia's 2015 Information Awareness Month. The talk was entitled "Information Celebration;" details are provided here. While on sabbatical this spring I spent parts of April and May at Curtin University in Perth, Australia. As a Visiting Fellow in the School of Media, Culture and Creative Arts, I partnered with Dr. Pauline Joseph on an ﻿iSquare research project in the domain of Records and Archives Management (RAM). Our work together marked the first application of an arts-informed, visual approach and the draw-and-write technique to understanding the central concept of “information” in RAM. The project built strategically upon the iSquare Research Program and leveraged its best techniques; see the dedicated project webpage that outlines the visit and associated events, here. Full text versions of my publications and conference presentations are now available at my Selected Works repository. On Saturday, February 21, 2015, I spoke at World Information Architecture Day in Ann Arbor, Michigan. 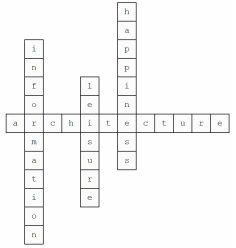 This local celebration of a world-wide event was hosted by the University of Michigan's School of Information; the theme was "Architecting Happiness." The title and abstract of my talk appear below. My presentation is best captured in the form of the diagram, above; it displays information architecture, happiness, and leisure in an interlocking framework. To start, I will celebrate the special work that information architects perform to envision and oversee the informational structures and patterns that reside underneath the surface of everyday life. Then, I will turn attention to one notably happy and cherished life experience – leisure! – and reveal the structures and patterns that exist therein, too. Finally, I will guide the audience to bridge and fuse these neighboring domains (information and leisure) in order to more mindfully design and manage products and services that generate happiness in leisure settings and beyond. In October, 2014 I was a visiting scholar at the Information School at the University of Sheffield, England. I have always wanted to experience this program, on account of the pioneering research on information behaviour that occurred at Sheffield. My host was Dr. Andrew Cox, with whom I share an interest in leisure information phenomena and arts-informed visual methods. While at Sheffield, I presented a colloquium about the iSquare project; collected iSquare drawings from students and then mounted the drawings as an exhibition (shown above); co-hosted an arts-informed visual research seminar with Dr. Cox; offered a career and thesis planning workshop to doctoral students; and met with many faculty members, including professor emeritus and information behaviour pioneer, Tom Wilson. Thanks to the Information School and Dr. Cox for supporting the very productive visit. Dr. Patrick Keilty, Dr. Jenna Hartel, Ben Walsh and Dr. Paulette Rothbauer. In September 2014, Ben Walsh successfully defended a superb masters thesis, Information Out in the Cold: Exploring the Information Practice of Homeless Queer, Trans, and Two-spirit Youth in Toronto. It was deemed to be of very high quality and passed with no modifications. The Thesis Committee included Jenna Hartel (supervisor), Patrick Keilty (Committee Member), and Paulette Rothbauer (External Evaluator from the University of Western Ontario). In early September 2014 I attended the Information Seeking in Context conference (ISIC) at Leeds University, England. ISIC is my favorite academic conference! At ISIC I participated in the Doctoral Workshop as a research mentor. I also presented the paper "Information Behaviour Illustrated" that examines iSquares for insights into information behaviour. Finally, I hosted the panel "State of play: Information phenomena in a leisure context" with Ian Ruthven, Max L. Wilson, and Christopher J. Young. The proceedings from ISIC will be published in fall 2014 in in online journal, Information Research. My former thesis student, Hailey Siracky (also mentioned below), won the first iSchool video contest with the brilliant, heart-warming animation, entitled Sky. It features, among many other wonderful images, the motif of Marcia Bates' "red thread of information." Congratulations, Hailey! On Friday, February 7, 2014 at 11:00 a.m. I presented a webinar entitled "iSquares: A New Approach to Research and Education in Information Science." The event is sponsored by ASIS&T's SIG-USE and SIG-HFIS. Click here to view the webinar. Hailey Siracky (left) completed an ethnographic thesis on spiritual journals at the Faculty of Information (Toronto); Jenna Hartel (right) was supervisor. In late August 2013 Hailey Siracky successfully defended an extraordinary thesis about journals and their role in the spiritual lives of Catholic youth. The thesis, entitled Spiritual Journal Keeping: An Ethnographic Study of Content, Materials, Practice, and Structure, was passed with no modifications -- a sign of its excellence. Congratulations, Hailey! 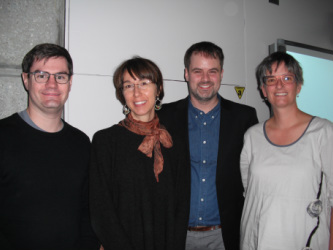 The Thesis Committee included Jenna Hartel (supervisor), Patrick Keilty (Committee Member), and Pamela McKenzie (External Evaluator from the University of Western Ontario). 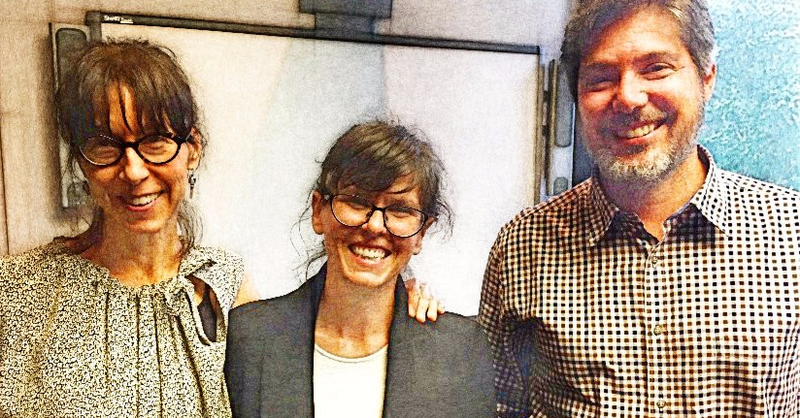 In March, 2013, my former advisee and collaborator Leslie Thomson (pictured in the photograph, at right), was accepted for doctoral studies in information at the University of North Carolina, Chapel Hill. Further, she was awarded a prestigious (and generous) 5-year Royster Fellowship (read all about it). Leslie is interested in visual research methods and personal information management; at UNC she will study with Barbara Wildemuth and Rob Capra. Congratulations, Leslie!